The light utilization efficiency and relative photon requirement of photosynthesis in pulsed and continuous light from light emitting diodes (LEDs) has been measured. First, we chacterized the photon requirement of photosynthesis from light of LEDs that differ in spectral quality. A photon requirement of 10.3±0.4 was measured using light from a 658 nm peak wavelength (22 nm half band width) LED over the range of 0–50 μmol photons m−2 s−1 in 2 kPa O2 in leaves of tomato (Lycopersicon esculentum Mill., cv. VF36). Because the conversion of electrical power to photons increased with wavelength, LED lamps with peak photon output of 668 nm were most efficient for converting electricity to photosynthetically fixed carbon. The effect of pulsed irradiation on photosynthesis was then measured. When all of the light to make the equivalent of 50 μmol photons m−2 s−1 was provided during 1.5 μs pulses of 5000 μmol photons m−2 s−1 followed by 148.5 μs dark periods, photosynthesis was the same as in continuous 50 μmol photons m−2 s−1. When the pulse light and dark periods were lengthened to 200 μs and 19.8 ms, respectively, photosynthesis was reduced, although the averaged photon flux density was unchanged. Under these conditions, the light pulses delivered 1017 photons m−2, which we calculate to be equivalent to the capacitance of PS I or PS II. Data support the theory that photons in pulses of 100 μs or shorter are absorbed and stored in the reaction centers to be used in electron transport during the dark period. When light/dark pulses were lengthened to 2 ms light and 198 ms dark, net photosynthesis was reduced to half of that measured in continuous light. 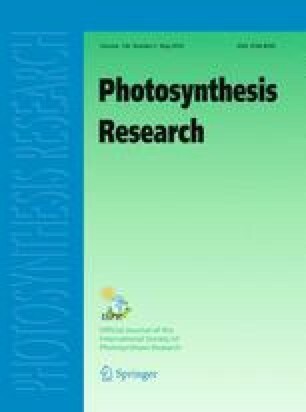 Pigments of the xanthophyll cycle were not affected by any of these pulsed light treatments even though zeaxanthin formation occurred when leaves were forced to dissipate an equal amount of continuous light.